June 09, 2008 by Alphageek in "Alphageek bourbon geocaching turkey shoot richmond rally 5"
Ok, the Alphageek recently won a Turkey Shoot. What exactly is a turkey shoot? I guess you could check on google, if you don't know. Because I am feeling generous, I will give it to you multiple choice. I thought about making the question into a poll, but I decided the poll would not be very interesting. I am also concerned that both my readers will get bored if I keep using the same tricks on them. 3) Some sort of reference to drinking Wild Turkey, making the headline a perfect reference to Alphageek's Thoughts. If you guessed the first one, you are probably some sort of hunter. In this case, please post a reply and explain to the rest of us what this reference means. If you guessed the third one, good job! This is a site about bourbon, after all, and you are using common sense. Unfortunately, common sense does not apply here. This is not an article about drinking Wild Turkey. If you are still reading, then you now know the answer is some sort of geek contest the Alphageek should win. Mrs. Alphageek and I attended the Richmond Rally 5. 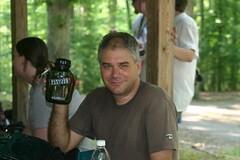 This is a geocaching event hosted by the Central Virginia Geocaching Society in Pocahontas State Park. CVGA gets together to host a fine event around the activity of geocaching each year. This year was really hot, both as a fun event and the temperature as the mercury soared to over 100 degrees. One of the fun events the group holds is the Turkey Shoot. Someone places a marker and takes the markers position. Each contestant then has to use his or her GPS to find the position of the marker. The one who comes closest wins the event. This year, there were four entrants tied for first place, so the names were drawn at random. I won the second place drawing. Mrs. Alphageek graciously pointed out that the winner just walked up and wrote down an answer in about five seconds while my entry took 15 minutes, but I am sure Mrs. Alphageek must have been effected by the heat. I inspected my prize, and found it very desirable. The prize is a survival kit that fits in a plastic canteen. I think the canteen could make an excellent storage container for bourbon in the future. "Alphageek bourbon geocaching turkey shoot richmond rally 5"